Jasvir Singh is a professional Indian Kabaddi player, born on 4 April 1984 in Haryana, India. Jaideep plays as a raider for Tamil Nadu based team Tamil Thalaivas, which takes part in the popular Pro Kabaddi league of India. Jasvir plays as an attacker in the sport of Kabaddi. He has leadership qualities and is an influential captain for Jaipur in the PKL. He has helped the Indian team and Jaipur with his immense raiding skills. Jasvir started playing Kabaddi at a very young age. The sport was taught to him by his elder brother back in Haryana. Jasvir was noticed in the professional Kabaddi scene in the year 2014. With the beginning of PKL, he played his debut season with Jaipur. Jasvir was a part of the Indian team which won the Asiad gold medal in 2014. He has also represented India in their win at the 2016 Kabaddi World Cup. 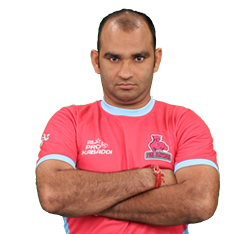 He has been a part of Jaipur Pink Panthers since the inception of Pro Kabaddi League. The Indian raider has contributed greatly to the Jaipur team with this skill and talent. Jasvir has played 46 matches in the Pro Kabaddi League. He has a total of 277 raid points and an average raid points of 6.02. The Jaipur captain also has a total of five super 10s. Jasvir had a low in his career in the second and third season of PKL, but the Indian raider denied the odds to bounce back in the fourth season and helped Jaipur reach the semi-finals of PKL. Jaipur Pink Panthers vs Haryana Steelers Match Prediction: Who will win today's Pro Kabaddi 2017 match?